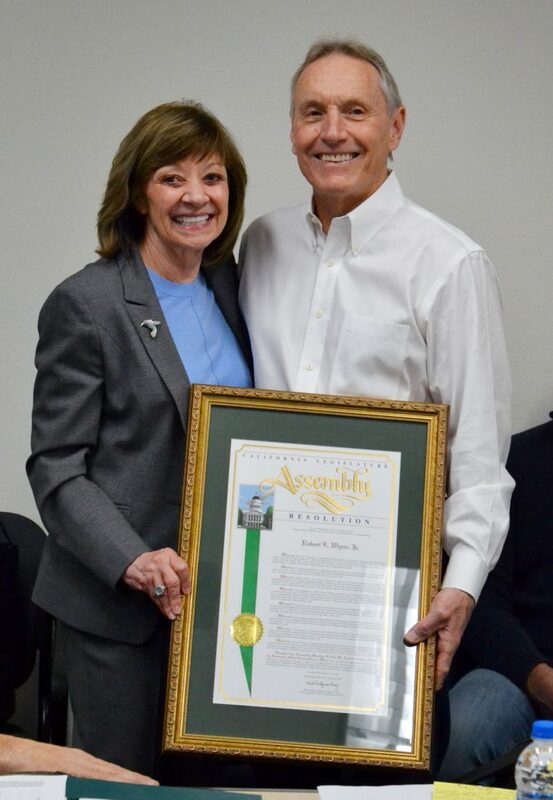 CDFA Secretary Karen Ross thanked and congratulated Bob Wynn for his exemplary career with CDFA, and presented a resolution commending Bob for his service from Assembly Member Cecilia M. Aguiar-Curry, Chair of the Assembly Select Committee on Wine, on behalf of the California State Legislature. Bob Wynn was appointed Statewide Coordinator for the newly created Pierce’s Disease Control Program in December 2000 – but his professional path to that position began 25 years before when he followed in the footsteps of his father, Robert Wynn, Sr., and began his career with the California Department of Food and Agriculture. He worked his way through the organization’s Inspection Services and Plant Health divisions, eventually leading each of them, before then-Governor Gray Davis approved the creation of the PD program and affirmed the industry’s and the department’s decision to put Bob at its helm. Today, at 2019’s first joint meeting of the Pierce’s Disease/Glassy-winged Sharpshooter Board and Advisory Task Force, Bob’s colleagues and staff said “thank you” and “farewell” as they shared memories of the program’s inception and the many challenges – and successes – along the way. Bob Wynn leaves the board and the program in good stead, with solutions for Pierce’s Disease in the pipeline in the form of disease-resistant rootstocks, and several other promising and creative approaches under development, thanks to the robust research regimen that has been part of this effort since the beginning. Along the way, Bob earned a reputation as a masterful communicator, an empowering leader and an encouraging boss. Bob embraced and employed principles of transparency and consensus-building that helped establish this exemplary, cooperative program as a model. Colleagues became friends; employees became family. Those relationships became the foundation of Bob’s success as a public servant. In recent years, Bob has also served as Senior Advisor to CDFA Secretary Karen Ross, who came to the department eight years ago but was also instrumental in the initial development of the PD program in her capacity then as president of the California Association of Winegrape Growers. Cheers, Bob. Your leadership of this program, your dedication to this department and your exemplary service to this industry and this state are sincerely appreciated. This entry was posted in Glassy-winged Sharpshooter, Pierce's Disease. Bookmark the permalink. 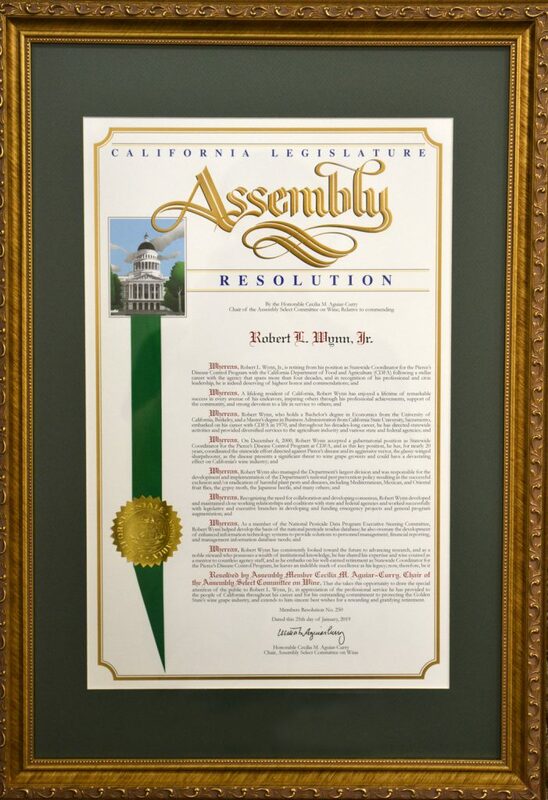 This is terrific news and a well deserve resolution for Bob Wynn. He and those who worked with him have certainly saved the grape industry from much destruction due to the Glassy-winged Sharp Shooter, which vectors Pierce’s Disease. We are grateful for his leadership! Congratulation to Bob! His leadership and contributions to promote and protect California and to guide the PD/GWSS Control Program are immensely appreciated.